SterlingFunder, the nation’s first crowdfunding for both accredited and non-accredited investors, has received national accreditation from Crowdsourcing.org, a neutral organization dedicated solely to crowdsourcing and crowdfunding. Accredition is through Crowdsourcing.org’s Crowdfunding Accreditation for Platform Standards (“CAPS”) program. The CAPS program is an initiative by Crowdsourcing.org to promote the adoption of best practices for the operation of crowdfunding platforms globally. Designed to protect both crowdfunders (people pledging or investing capital) and fundraisers (companies raising capital), the CAPS program's mission is to foster sustainable growth of the crowdfunding industry. “We are proud to have platforms like SterlingFunder enrolled in the accreditation program, Crowdfunding Accreditation for Platform Standards (CAPS), and as the director of that program I am confident that SterlingFunder will provide a much needed ease of access to capital and investment opportunities for Georgia's entrepreneurs and investors, respectively," said Kevin Berg Kartaszewicz-Grell, CAPS Program Director." SterlingFunder is also a member of the Crowdfunding Professional Association (CfPA) and Crowdfunding Intermediary Regulatory Advocates (CFIRA), two membership organizations working with regulation, reporting and compliance oversight of the crowdfunding industry. SterlingFunder is currently the only equity and debt crowdfunding platform in the nation for both accredited and non-accredited investors, through the Invest Georgia Exemption. The portal at http://www.sterlingfunder.com offers investors and entrepreneurs an innovative and feature-rich site for education and engagement in crowdfunding with the highest level of security and protection. 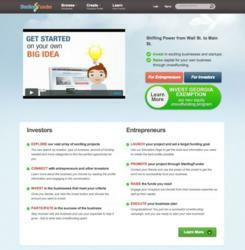 SterlingFunder is an Atlanta-based equity and debt crowdfunding platform. In addition to facilitating national crowdfunding transactions, SterlingFunder is the nation’s only crowdfunding portal for non-accredited investors, under the Invest Georgia Exemption. Please visit http://www.SterlingFunder.com for more information.